Can 2 political émigrés foment a revolution in Russia from abroad? Former YUKOS head Mikhail Khodorkovsky and former Evroset owner Yevgeny Chichvarkin during an online news conference in the Moscow office of the Open Russian movement. With half a year remaining before parliamentary elections in Russia, not only the Russian government but also its opponents have intensified their activities. In London two millionaires are open in their support for a revolution in Russia. But instead of undertaking concrete action they are waiting for the government to make mistakes. Overthrow Russian President Vladimir Putin, form a temporary administration and then see how it goes – that’s the plan. Two Russian émigré businessmen with revolutionary ambitions are sitting opposite each other in London: Mikhail Khodorkovsky and Yevgeny Chichvarkin. The first is a former oil baron; the second is the owner of Russia's largest mobile phone retailer, also a former owner. 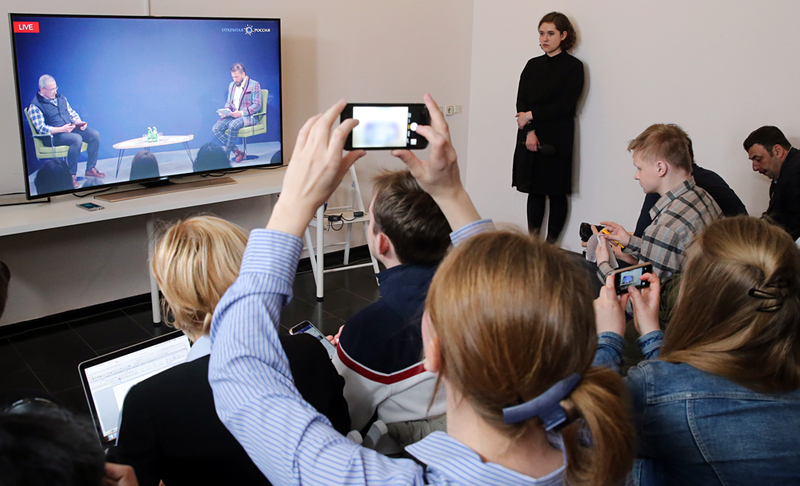 Their audience, however, is in Moscow – the discussion is being broadcast via a telebridge. Three days before the broadcast, on April 15, Khodorkovsky published a manifesto on the site of his Open Russia foundation. "Our objective in the relatively near future is to have Putin and his friends resign from the government, to launch a political process in Russia and guarantee the first absolutely open and honest elections,” it reads. Neither Chichvarkin nor Khodorkovsky have appeared in Russia since leaving it. But now they are convinced that revolution is inevitable, that it will be carried out by émigrés, by them personally. "I never planned to get involved in politics," says Chichvarkin. Who are these London ‘revolutionaries’? "I had 55 million customers, I serviced a third of the country's population," recalls Chichvarkin, sitting on the stage in a plaid suit and wearing a large earring. He established his Evroset mobile telephone empire in 1997 and in 2008 his office was inspected by the authorities, who filed a lawsuit against him for kidnapping and extortion. The millionaire himself is convinced that the company was raided as part of a takeover. In the end he sold Evroset and after emigrating began selling high-quality wines. "What is Chichvarkin known for? He is an eccentric both in life and in politics," said Alexei Zudin, a political analyst and member of the expert council at the Moscow-based Institute of Socio-Economic and Political Studies. After the change of government in Ukraine, Chichvarkin reportedly wanted to become Ukrainian Minister of Economics, but that did not happen. In 2015 the mass media predicted he would become head of Ukrnaft, Ukraine's leading oil and gas company, but that also did not materialize. Now from the London stage he says that a new Maidan awaits Ukraine and that “color” revolutions "should not be feared." Khodorkovsky smiles. Khodorkovsky is the former chief of the now-defunct Russian oil company Yukos, controversially dismembered by the state in 2003 after he was arrested on what many believe to be trumped-up charges of fraud – Khodorkovsky had openly hinted that he was planning to enter politics. After having spent 10 years in jail Khodorkovsky was unexpectedly pardoned, and made it clear that he had no longer had any plans to get involved in politics, but after the Olympics in Sochi, in his words, the government became increasingly harsh in its attempts to crack down on civil society and freedom of speech. It was from London that Khodorkovsky began speaking of a revolution, while a lawsuit was filed against him in Russia – a renewed investigation into the contract killing of the mayor of the Siberian city of Neftyugansk in 1998 on charges widely seen as fabricated. In fact, Khodorkovsky has not said anything different from his previous public appearances: The upcoming State Duma elections are "non-elections," there will also be no change in the government in 2018, while the revolution is planned for 2024 "or several years before that." Meanwhile, Chichvarkin believes that changes of power should be carried out through educational initiatives and reminded the audience that it was precisely with a teachers' demonstration that the governmental change in Czechoslovakia in 1989 began (actually it was a student demonstration – RBTH). Political scientists are shrugging their shoulders, calling these statements "clearly venturesome." And the ever-serious, ever-rational Khodorkovsky appears out of place on the same stage as Chichvarkin. Do the London "revolutionaries" understand this? Probably. But it is important to establish a position before the elections begin, notes Mikhail Remizov, president of the Institute of National Strategy. If everything goes calmly, fine, but if there is turbulence "you can always say that it is due to our efforts," he says. Furthermore, notes Georgy Satarov, president of the INDEM Foundation, the revolutionaries know that if you cannot take significant action, then you should create local informational challenges and wait for the government to make a mistake. In certain circumstances, if they do not create tensions they can at least make an impact. But for this to happen many factors must coincide. The political system in Russia is now extremely stable, while the domestic crisis is an issue that does not depend on political émigrés very much, conclude the experts. Currently the government can ban any activity linked to Khodorkovsky and his protégé's structures in Russia (an hour before the beginning of the telebridge the upper chamber of Russia's parliament permitted a ban on Open Russia – RBTH). It is no secret that the two businessmen openly define themselves as anti-constitutional forces.